I realize I never post on Twins Chatter anymore, but last week such a monumental event occurred that it could not go un-commented upon. 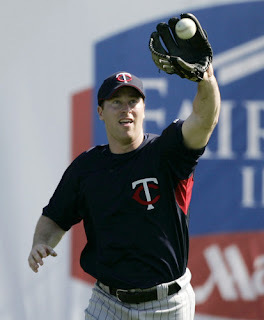 Lew Ford, the Official Player of Twins Chatter since early 2004, finally saw his roller coast career as a Minnesota Twin come to an unceremonious end on Thursday when he was dropped from the team's 40-man roster. As it turned out, 2004 was the high point of his career - in addition to the AMAZING .419/.471/.710 he hit during April (including 17 RBIs) he hit a solid .299 with 15 homers and 72 RBIs for the season. It truly was a dream season for Lew, the Twins (until that whole losing-to-the-Yankees-in-the-playoffs ending) and Twins Chatter. But now that legacy, just like the legacy of TC, has come to an end. Let's all pause for a moment to remember all the good times that we had. Slow Starts, or Something More? The 2007 baseball season is only about 20 games old, but those handful of contests (approximately 12 percent of the entire season) have taught us a lot. We know that Barry Bonds will likely break Hank Aaron's career home run record sooner rather than later (he has six homers already this season), Alex Rodriguez has more talent in his little pinky than you do in your entire body (14 home runs already this year!) and Daisuke Matsuzaka may have been a smidge overhyped (but will still be solid). But what about when it comes to the hometown Metropolitans, the defending division champions? Through Wednesday, the Twins sported a decent 11-10 record, good enough for fourth place in the American League Central. Although it is too early to make any definitive statements (remember Henry “Hammerin' Hank” Blanco's red-hot start in 2004? ), 21 games can serve to confirm or debunk some preseason expectations. Ramon Ortiz: No one expected much out of this journeyman righthander, me least of all. Ortiz has been a revelation so far in April, turning in four outstanding performances and collecting three wins. He has been doing exactly what made him successful in Anaheim from 2001 through 2003: Keeping the ball down (i.e. in the ballpark) and letting his defense work behind him. Twins fans need to know that Ortiz isn't going to retain his current 2.45 ERA all season long – he will struggle at times, and you will wonder “How did that guy hit the ball that far?” when Ramon serves up another hanging slider in June. But it looks like playing for an improved team will help Oritz resurrect his previously-floundering career. Fearless Forecast: 13 wins, an ERA around 4.25 and $3.1 million well spent. Nice work, Terry Ryan. Nick Punto: I realize Punto has missed time with injuries, but his .186 batting average and .262 on-base percentage to start the year should send up red flags all over the place. An outstanding defensive player, Punto needs to make consistent contact in order to have success at the plate. When he was hitting well last year (May through August), Punto drew a walk nearly as often as he struck out (41 walks versus 46 strikeouts). His September slump last year (Punto batted just .252) saw him strike out 18 times while walking just three times. This year? Ten strikeouts in 64 plate appearances and only six walks. Punto needs to step up at the plate or last year's “Tiny Superhero” may find himself on the bench. Fearless Forecast: Punto doesn't regress completely, but can't replicate last year's numbers. Gardenhire stubbornly keeps him at third the entire year. Carlos Silva: Is “The Jackal” back? A 2.74 ERA through four starts might have you thinking Silva has regained his 2005 form, but that hasn't exactly been the case. The 2005 version of Silva walked just nine batters in 188 1/3 innings that year and threw complete games of 74 and 85 pitches. This year, Silva has already walked six in 23 innings and needed more than 100 pitches to get through five innings in two starts. For comparison, he only threw 100-plus pitches twice in 32 starts back in 2005. It's heartening to see that Silva hasn't been the worst starting pitcher in the American League this year (as he was in 2006), but I'm not ready to proclaim his comeback a success just yet. Fearless Forecast: Silva isn't the train wreck that he was in 2006, but never regains his 2005 form. An ERA around 4.75 is good enough to stay in the Twins' rotation, though. Sidney Ponson: Who can't say “I told you so” on this one? Last week's shellacking by the punchless Kansas City Royals (and last night’s equally unimpressive display) signaled the beginning of the end for this Aruban knight. Ponson simply doesn't have the stuff to overcome the lack of pitch location he's displayed so far. He'll get about three more starts to prove he's not totally inept, because the Twins have three stellar starting pitching prospects waiting in the wings. Fearless Forecast: Sir Sidney takes his substantial belly, greasy mullet and $1 million guaranteed salary back to his native Aruba after being released in early May. Joe Mauer, Michael Cuddyer, Justin Morneau and Torii Hunter: Ah yes, now I remember why I still like the Twins in 2007 – these four middle-of-the-order mashers. The team's number three through six hitters rival every squad in the American League not named the Yankees, and all four have hit well this year. As long as the “Piranhas” don't fade into obscurity, these four players will carry a solid Twins offense all year. Fearless Forecast: 100-RBI seasons for Morneau, Cuddyer and Hunter, and a .325 batting average for Mauer. What more could you ask for? Even though the majority of my thoughts here may seem pessimistic, let it be known that I'm still bullish on the 2007 Twins. The American League Central is going to be a dogfight down to the bitter end, but the Twins have the pitching depth and offensive star power to be a contender well into the fall. Whether or not the team earns its fifth playoff berth in six years remains to be seen, but I wouldn't be surprised if they did. No matter what happens, it's going to be another exciting summer. If you're interested in blogging and the decline of the newspaper industry, I recently wrote an article for my school newspaper. I've got sources within the Star Tribune and elsewhere, and I think it's an enjoyable read if you have the time. Click here to read "New Ways to See the Game."